St. Peter’s Church, Howtown. The start point for the Fusedale Round walk. Monday was an early start. Mum had to be at Ormskirk Hospital at 7am. We arrived in good time and once she was settled on the ward, I was shooed off. By 8am I was heading for the M6 and the Lakes. I arrived at Howtown just after 10am, having stopped for breakfast on the way. I wouldn’t normally breakfast at Burger King but that sausage muffin really hit the spot! The weather was just about perfect for walking; cool (for April) but dry and very clear with just enough blue sky to make it feel like spring. I left the car, took the footpath to the rear of St. Peter’s Church and started the steep climb to Steel Knotts. It’s a tiring slog but all the way, the views over Ullswater are opening up and there are plenty of opportunities to take short breathers while surveying the scene. I reached Pikeawassa in good time and then headed on south, skirting Gowk Hill and then towards the head of Fusedale. 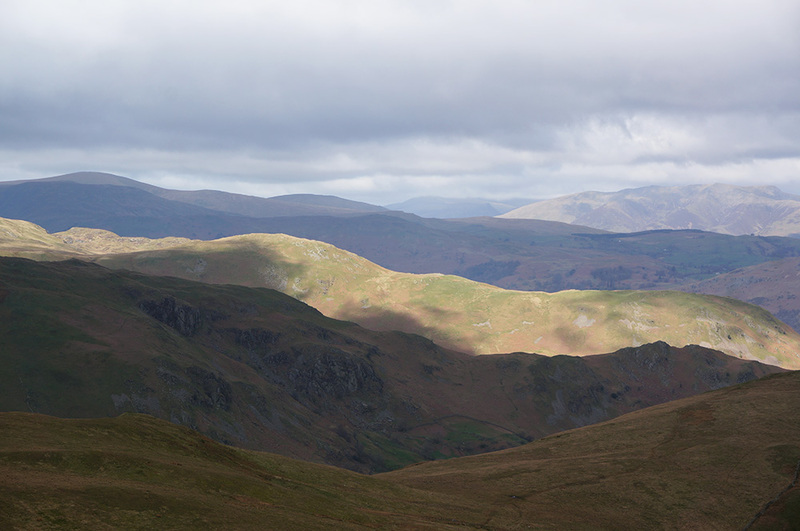 Many of the Lakeland fells are formed along a series of ridges, which are highlighted in layers as the sun illuminates some and not others. Swinging south-west, the next slog is the climb to High Street and Wether Hill, the highest point on the walk (a moderate 673m). On reaching the ridge, I was disappointed to find that High Street was not as I had imagined. In my head, it was a single, well-defined path, it’s a Roman road after all. On the ground, it was a confusion of near-parallel routes running through a badly eroded landscape. With no obvious peak, the summit of Wether Hill is not the easiest to find but fortunately, the GPS pointed the way. There is a small cairn and stone boundary post at the summit and not much else. Wainwright describes it thus: “The summit is popular with grazing animals of various species, but humans will find it a dreary and uninteresting place.” Fortunately, the route north is clear and I was soon on the way to Loadpot Hill, a much easier summit to find with it’s clear, stone-built trig pillar. I was hoping to have some lunch at Loadpot Hill but there’s just nowhere to sit and it’s pretty exposed; even though the day was relatively fine, there was still a cold breeze. So I kept going and headed for Arthur’s Pike, hoping to find shelter there. As it turned out, Arthur’s Pike is an excellent spot to lunch with plenty of shelter close by the summit. The sun came out to warm the entire scene and Skylarks rose and fell, singing their hearts out. A really lovely experience. 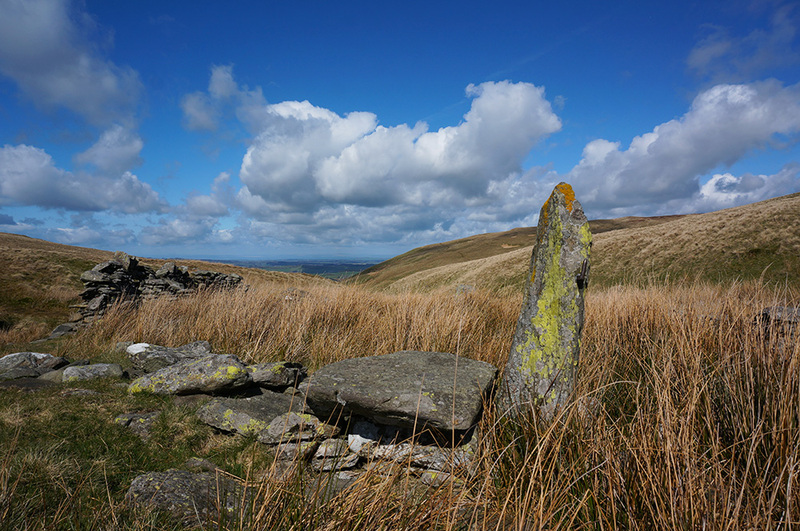 A beautiful and tranquil spot; the derelict sheep fold at the crossing of Swarthbeck Gill on the path between Arthur’s Pike and Bonscale Pike. After lunch, I set off for Bonscale Pike. The path leads down to Swarthbeck Gill and although having to drop down only to climb up again is a chore, the spot where the path crosses the beck is a real beauty. There’s a ruined sheep fold that sits beautifully at the centre of this scene as the clear waters of the beck burble past. I made a mental note to have my lunch here next time I visit. 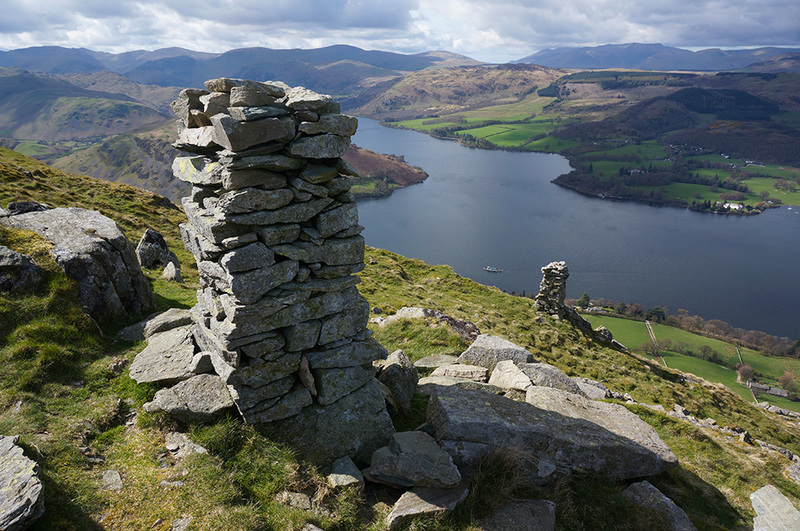 Bonscale Pike summit is quickly reached after leaving the beck and from the top there are fantastic views over Ullswater. There isn’t much of a summit cairn but that’s not the key feature of this top. I was interested to see the stone pillars (known as Bonscale Tower). In truth, they are “pillars” and not “towers”, being slightly larger that an OS trig pillar. Wainwright’s guide shows the higher pillar looking poorly built but currently, both are in good order. The summit itself is slightly unsatisfactory as there is higher ground close by and like many fell tops, it’s unclear why that particular spot was chosen. 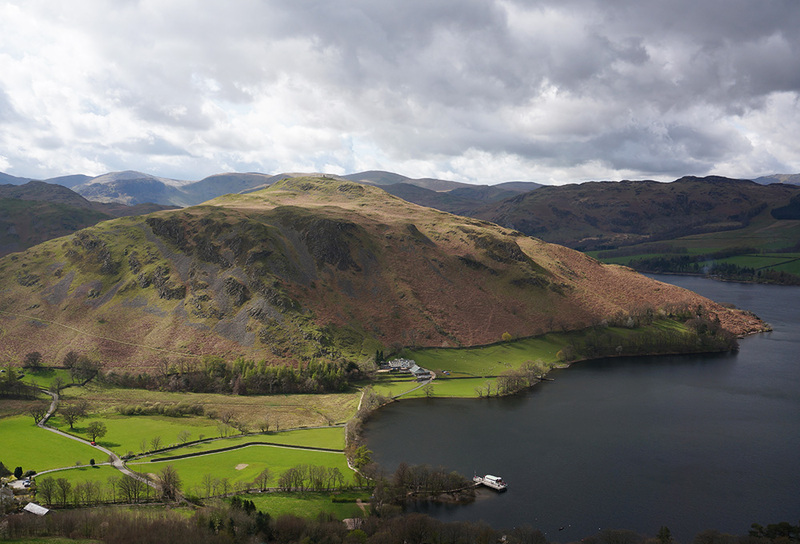 The Bonscale towers, looking down on the Ullswater Ferry with Gowbarrow Fell and the Helvellyn Range beyond. 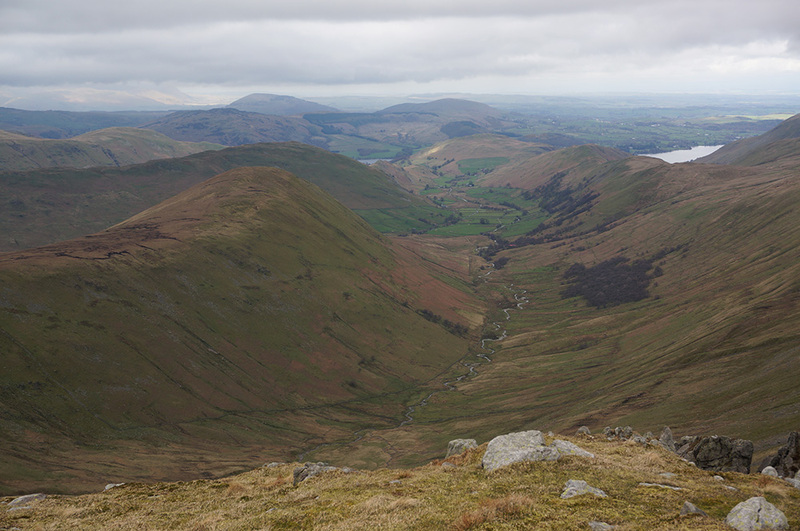 The Descent from Bonscale Pike is not obvious except that there is no easy way down directly from the summit. The route requires a short trek north-east before finding the indistinct path leading down the steep slope to Mellguards. After reaching the road, I decided to take a walk down to the lake rather than the more direct path. There’s something satisfying about standing at the shore of a lake when, less than an hour previously, you’ve been looking down on it from above. After a moment of contemplation, there was just the wearisome route up the zig-zags and back to St. Peter’s. Hallin Fell from the steep path down from Bonscale Pike. The summit tower is just visible. I drove back to Southport at the end of the day and to the news that Mum’s operation had gone well, I went in to see her the following day. 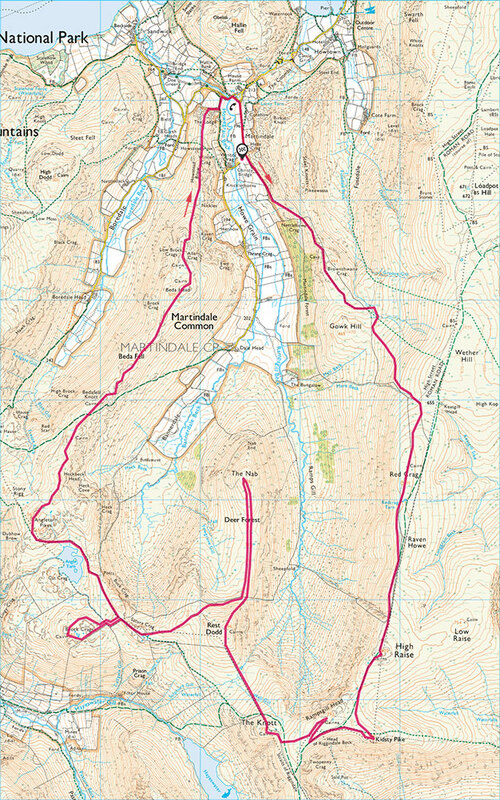 The Fusedale Round (13.0km and 752m of ascent). Start/end: St. Peter’s Church, Howtown. I’d chosen a moderately easy walk to kick-of the 2017 walking season so I could test my fitness before taking on anything more strenuous but I was feeling pretty good after the walk and was looking forward to getting stuck into my next adventure. Thursday morning wasn’t nearly as promising as Monday. I drove up the M6 from Southport in the rain but with the forecast promising a dry day in the Lakes. The journey north was lifted somewhat by one of my favourite radio programmes. During the period when I regularly commuted by car to Dartford and then to Avery Hill, Thursday was my favourite commute because that’s when In Our Time is broadcast on BBC Radio 4. It’s a programme, hosted by Melvyn Bragg where, each week, a different topic is discussed with a small group of academics. Topics range widely from history and philosophy to physics and religion. This week’s topic was Rosa Luxemburg. I’m not a historian and although I knew of her, I knew nothing about her story, so the majority of the journey was spent learning something new. 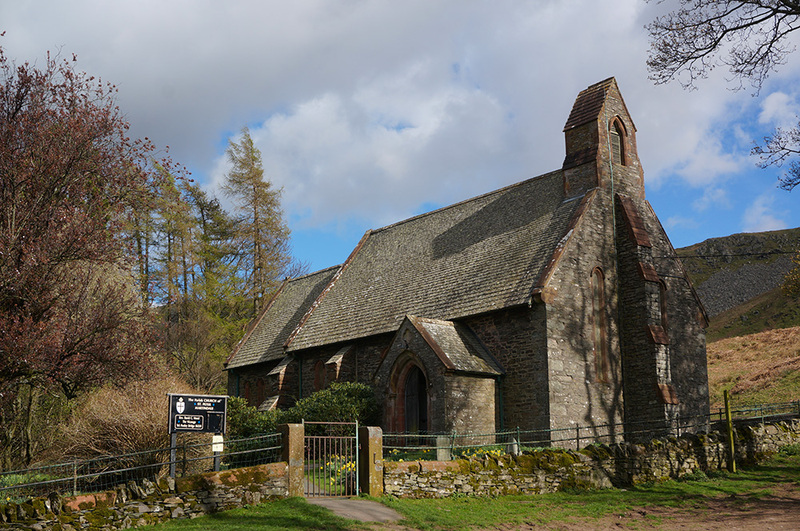 St. Martins Church, Martindale. The start point for the Martindale Round walk. 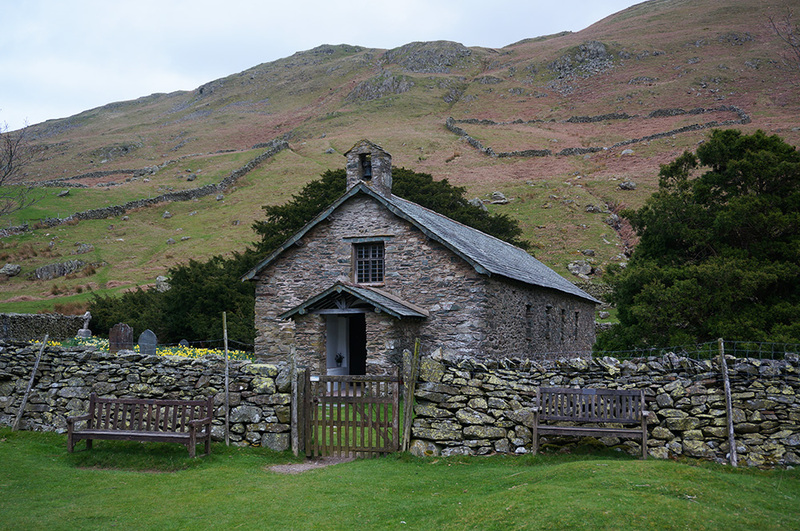 The start point for this day’s walk was another church; St. Martin’s at Martindale, known locally as the “old church”, the newer St. Peter’s being just a short walk away. The outward leg leads off, under Steel Knotts, skirts Gowk Hill and then climbs to High Street, meeting that route a little further to the south than I had earlier in the week. From that point, I followed High Street (one of the many braided routes) as it climbed slowly but surely up to High Rise, the highest point on the walk at 802m. I got to Hight Rise summit just before midday and such is the grouping of Wainwrights in that area, I was able to bag 4 in an hour. From High Rise, it’s under a kilometre to Kidsty Pike, a few hundred metres from there to Rampsgill Head and not much more again to reach The Knott. It’s the junction of a number of ridges and the cross roads of the Coast to Coast route and High Street. There are also some great views, both north and south, the most impressive being the view from Kidsty Pike across Riggindale to the bulky mass of High Street, the highest point along the High Street route. Looking across Riggindale to High Street from Kidsty Pike. Unlike Kidsty Pike, Rampsgill Head is not an obvious summit; it is a plateau with a number of scattered cairns. The main summit cairn does not have the best view, which is probably why there are a number of viewpoint cairns to the north, providing excellent vistas down onto Rampsgill Beck as it meanders its way into the green farmland of Martindale. Despite the overcast weather, the air was clear and the scene is filled with recognisable peaks. Hallin Fell is prominent at the centre of the view, with Great Mell and Little Mell fells beyond. Rampsgill Beck meanders and Martindale from Rampsgill Head with The Nab on the left. 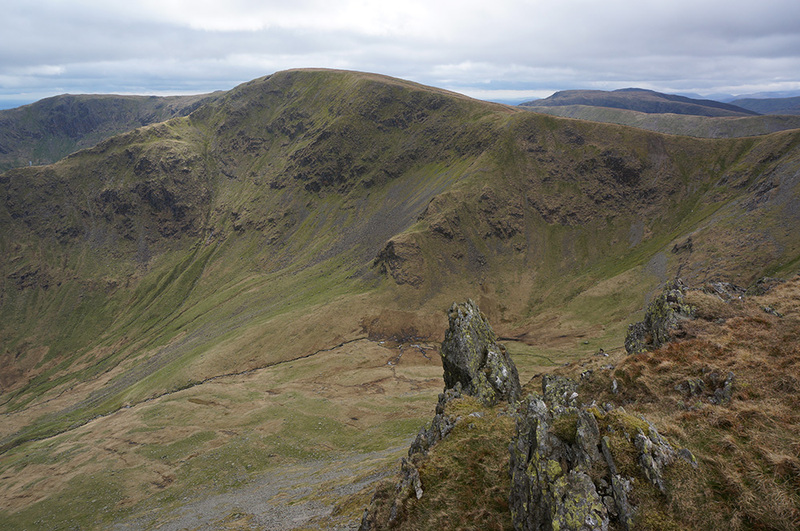 The Knott is a slightly controversial inclusion in Wainwright’s fells. Some consider it a shoulder to Rampsgill Head and although that’s the impression from some angles, it definitely has the feeling of an independent fell once you arrive at the summit. It also has a significant cairn, perhaps as a rebuke to those who deny its status but probably more to do with the availability of stone in the vicinity (a broken down wall crosses the summit). Looking back to The Knott from the climb to Rest Dodd along the straight wall, which runs between the two. 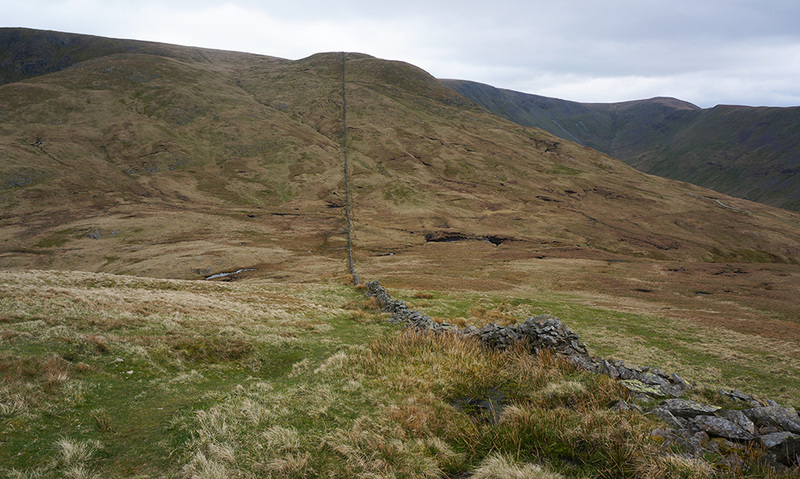 The next point of call is Rest Dodd but getting there is no mean feat, it requires a fall of 140m and a rise of 100m. There is a faint path to follow but most reassuringly there is an arrow-straight wall connecting the two peaks. It’s just over 1km from The Knott and half an hour later, I was standing at the Rest Dodd summit cairn. The Nab is another controversial Wainwright top, but not on geographical grounds. Mark Richards believes it should never have been included because it falls within a deer reserve and I was in two minds as to weather I should take the out-and-back route to the summit. In truth, I wasn’t entirely sure I’d have the time to fit it in on this walk and I still wasn’t quite sure when I reached the top of Rest Dodd. Should I go north to The Nab or should I give it a miss and go west to Brock Crags? Shortly after reaching the summit I was joined by a fellow walker who told me he had just come from The Nab. I explained that I was in two minds about it and he told me he had attempted it a month ago but that he’d had to turn back because the route was so boggy. He told me that today was a good day to do it because it was so dry and I should definitely do it if I had time. That made up my mind and I set off north. Eroded peat hags on the route to The Nab. 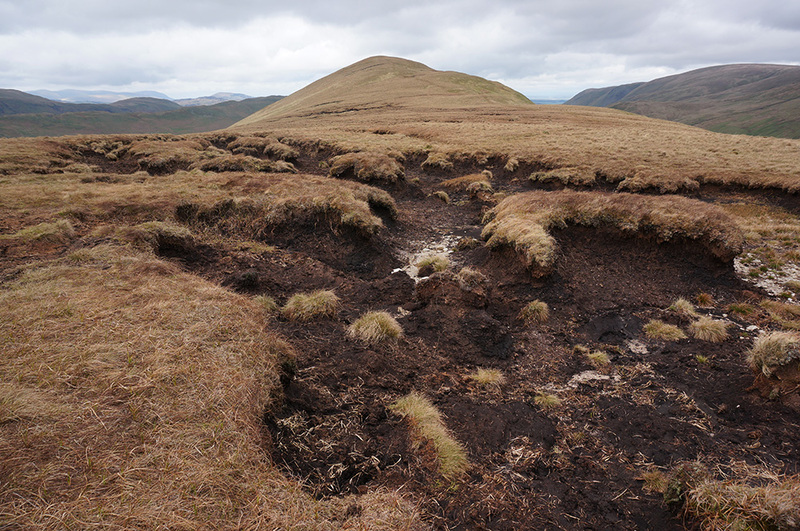 Peat hags are a feature of a number of upland locations in The Lakes; they are caused by the erosion of soft peat and often make the landscape difficult or impossible to cross. The saddle-back of the ridge that leads to The Nab summit is covered with them but fortunately, as my fellow walker had told me, the land was relatively dry today and I managed to get to the summit half an hour after leaving Rest Dodd. I retraced my steps until reaching the wall under Rest Dodd and followed it west until I reached the path to Satura Crag and the Coast to Coast path. From there it was a short trek to Brock Crags and my seventh Wainwright of the day. I was hoping to find a route across to Angletarn Pikes without going back on myself but I ended up doing just that and then headed north-west beside Angle Tarn. Angle Tarn from the Coast to Coast path. 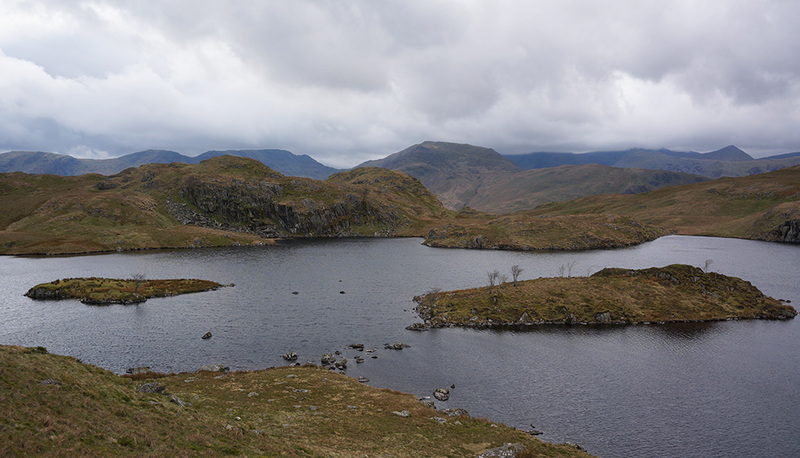 It’s said that Angle Tarn is one of the most beautiful in the Lakes and I’m sure the overcast conditions didn’t do it justice and I didn’t really have the time to linger so it’s now added to my lengthening list of places I’d like to return to. Just after the tarn, I struck off the Coast to Coast and took a very indistinct path up to the north top of Angletarn Pikes. It’s a steep climb and for the first time during the day, my legs started to feel a little weary. I still had a stretch to do but fortunately, most of it was downhill. I’d last visited this spot the previous August with Tilly and as it looked like there might be some rain coming in from the west, I stopped only long enough for a quick breather before heading off for Beda Fell. It was a long 3km, the temperature dropped, the wind got up, there was rain in the air and I was feeling tired. I arrived at Beda Head just after 4.30 and realised that I’d been walking, almost non-stop for over 6 hours – I hadn’t taken a lunch break in order to give myself enough time to take in what I considered to be the optional tops on this walk (The Nab and Brock Crags). But having reached the final Wainwright of the day in pretty good time, I was feeling rather pleased with myself. However, I didn’t get back to the car for another hour because I missed the footpath down to Martindale and ended up walking to the end of the ridge and then back along the road to Martindale Church. The Martindale Round (22.6km and 1318m of ascent) Start/end: St. Martin’s Church, Martindale. 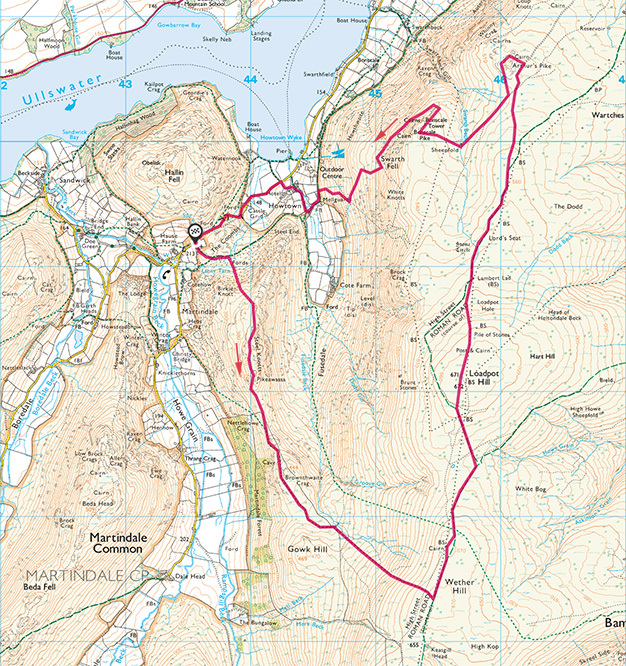 This walk marks a number of personal bests; the most Wainwright’s in a day (9), the longest day walk (14 miles) and the most ascent in one day (1318m), all in seven and a quarter hours. That’s a pretty good benchmark for what’s possible in a day and it’s given me more confidence to take on some of the other long walks described in Stuart Marshall’s Walking the Wainwrights. That completes 78 Wainwrights, leaving just 136 more. Summit photographs for all the above fells can be viewed on the Far Eastern Fells page. I’m trying out a year’s subscription to OS Maps that I got free as part of my subscription to Trail Magazine and I’m finding it to be really useful for planning walks and recording the walks I’ve actually taken. It’s a browser-based service but functionality is excellent (although not perfect). From now on I’ll be using it to plan all my walks and to add illustrated routes to my journal entries. For my birthday this year, I bought a Fitbit One in an attempt to maintain my fitness between trips to the Lakes and so far it’s been a real motivator; I’m doing much more walking as part of my daily routine and I’m feeling better as a result.